Adam Frans van der Meulen - Louis XIV Arriving in the Camp in front of Maastricht. Louis XIV’s power, which had allowed him to reverse the verdict of five years of warfare between Sweden and Brandenburg, rested on several foundations. One was the settlement that brought the Thirty Years War to an end in 1648. The Peace of Westphalia gave France very little in terms of territory–ten towns in Alsace and the fortress of Breisach–but a great deal in terms of security. The formal recognition of Dutch independence by Spain greatly diminished, if it did not entirely dispel, the nightmare dating back to the late fifteenth century of encirclement by Habsburg territory. The agreement with the German princes forced on the Emperor Ferdinand III meant that his father’s dreams of turning the Holy Roman Empire into a monarchical state had receded half-way to oblivion. The soft centre of Europe was to remain soft and, now that both France and her Swedish satrap were guarantors of the Westphalian settlement, the way was open for future intervention in German affairs to make sure that it stayed that way. The French diplomat who remarked that the Peace of Westphalia was ‘one of the finest jewels in the French crown’ would have enjoyed reading Geoffrey Barraclough’s later verdict: ‘broken, divided, economically weak, and lacking any sense of national unity, Germany became virtually a French protectorate: even in the imperial diet at Regensburg the dominant voice was that of the French ambassador’. As we shall see later, that contemptuous dismissal of the Holy Roman Empire is at the very least exaggerated. In the short term too, the French voice everywhere in Europe was stifled by the civil disturbances known as the Frondes, which began just a few months after the conclusion of the Peace of Westphalia and lasted for the best part of five years. One reason for their prolongation was their cross-fertilization with the continuing war between France and Spain, the only major international conflict not to have been resolved in 1648. Neatly encapsulating this interaction between foreign and domestic strife was the final major battle of the war, outside Dunkirk on 14 June 1658, when the French army was commanded by the vicomte de Turenne, younger son of the duc de Bouillon, and the Spanish army by the prince de Condé, Louis XIV’s cousin. Both men had served on both sides during the Frondes. Moreover, on the French side there was a substantial force of English soldiers, sent by Lord Protector Cromwell, and on the Spanish side a substantial force of English (and Irish) soldiers, commanded by the Duke of York, brother of the exiled Charles II. The ‘battle of the Dunes’ ended in a decisive victory for the Anglo-French forces and paved the way for the Peace of the Pyrenees, signed in November the following year. This took France’s southern frontier to the eponymous mountain range by the acquisition of Roussillon and Cerdagne, while the northern frontier was extended by the acquisition of Artois and some fortified towns in Flanders. The prospect of far greater gains in the future was also opened up by the marriage of Philip IV’s daughter Maria Theresa to Louis XIV. Although she formally gave up all claims to the Spanish throne, her renunciation was conditional on a substantial dowry being paid, a remote contingency in view of endemic Spanish insolvency. Not that anyone supposed that such a pledge would be allowed to interfere with the prosecution of French interests. Back in 1646 when such a match was first mooted, Cardinal Mazarin had stated bluntly, ‘once the Infanta marries His Majesty, we can hope for the succession to the Spanish thrones, whatever renunciations she has to make’. Two years later, when Mazarin died, Louis took personal control of his country. What is perhaps most surprising about his personal rule is that he took so long to start throwing his weight about. In 1664 the Pensionary of Holland, Johan de Witt, composed a prescient memoir in which he observed that as France now had ‘a twenty-six-year-old king, vigorous of body and spirit, who knows his mind and who acts on his own authority, who possesses a kingdom populated by an extremely bellicose people and with very considerable wealth’, war was inevitable, for such a king would have to ‘have an extraordinary and almost miraculous moderation, if he stripped himself of the ambition which is so natural to princes…to extend his frontiers’. De Witt was the most important official of the most dynamic and prosperous republic in Europe, but his belief that monarchs had an inbuilt expansionist streak was well-founded. As John Lynn has argued, war was not a means to an end but an essential attribute of sovereignty, to be pursued by a king for its own sake. For only success in war could bestow the ‘gloire’ that formed the core of the royal and aristocratic value-system. As Cardinal de Retz put it: ‘that which makes men truly great and raises them above the rest of the world is the love of la belle gloire’. When Mazarin told his protégé that ‘it is up to you to become the most glorious king that has ever been’, he did not have social welfare or economic prosperity in mind. Louis got his first opportunity to achieve martial glory when Philip IV of Spain died. On behalf of his wife, Louis claimed parts of the Spanish Netherlands (Brabant, the marquisate of Antwerp, Limburg, Malines, Upper Gelders, Namur) and a third of Franche-Comté under the local ‘law of devolution’, by which the daughters of a first marriage took precedence over the sons of a subsequent union. In fact, the right of devolution was a private not a public law, as the Spanish could easily demonstrate. Undeterred, in 1667 Louis prosecuted this claim by sending an army under Turenne into the Netherlands in May and another under Condé (now back in favour) into Franche-Comté the following February. As if to emphasize the royal virility exemplified by this exercise, he himself set off for war in a carriage containing, among others, his wife and two mistresses. Military success was total, but it provoked a less agreeable diplomatic response in the shape of a hostile triple alliance of the Dutch Republic, Sweden and England. At the Peace of Aachen, signed on 2 May 1668, Franche-Comté had to be handed back, but several towns in the north were gained: Bergues, Furnes, Armentières, Oudenaarde, Courtrai, Douai, Tournai, Binche, Ath, Charleroi and–most importantly–Lille. This was a triumph sufficient to unleash a torrent of odes, medals, paintings and statues, but the manner in which his progress had been checked clearly stuck in Louis’ craw. In particular, he was outraged by the ‘ingratitude, bad faith and insupportable vanity’ of the Dutch, traditionally France’s ally but now taking the view that a flaccid Spain was a more attractive neighbour than a rampant France: Gallicus amicus sed non vicinus (France as a friend but not as a neighbour). As the ‘royal historiographer’ Racine put it, the Dutch Republic had been ‘blinded by prosperity, [and so] it failed to recognize the hand that so many times had strengthened and supported it. Leagued with the enemies of France, it preferred to give the law to Europe and prided itself on limiting the conquests of the King.’ To add insult to injury, French suggestions that the two countries might partition the Spanish Netherlands went unheeded. There were also commercial considerations at stake, for Colbert believed that whereas the Dutch had 15–16,000 ships and the English had 3–4,000, the French had just 600 and that, as a result, Dutch shipping annually drained 4,000,000 livres from France. Dutch retaliation for the protective tariffs imposed in 1667 by banning imports of wines and spirits from France was another bone of contention. After the slippery Charles II of England had been detached from the Triple Alliance by the secret Treaty of Dover of 1670, the eastern frontier had been secured by the occupation of the Duchy of Lorraine in 1670, and the support of two strategically important German ecclesiastical states (Cologne and Münster) had been purchased, Louis declared war on the Dutch in April 1672. At first, the enormous French army of around 130,000, led by Turenne, Condé and the duc de Luxembourg under the overall command of the King in person, carried all before it, not surprisingly as it enjoyed a numerical advantage of four to one. In twenty-two days they captured forty towns and were within striking distance of Amsterdam, defended by a garrison of just 20,000. Then things went wrong. Indeed, with the advantage of hindsight, it might even be argued that this was the turning point of the reign. For Louis now committed the same cardinal sin that was to preordain the failure of Napoleon: he forgot that war should be nothing more than the continuation of policy by other means and allowed military success to dictate his war aims. With total victory apparently certain, he dictated terms to the Dutch that were ‘as brutal and uncompromisingly vindictive as any that European powers have inflicted on each other in the course of their history as nation states’ (Simon Schama). They amounted to territorial, financial, economic, religious and military subjection. As a reminder of their subservient status, a Dutch delegation was to attend the King of France each year, bearing a medallion giving visual expression to their repentance, subjection and gratitude for being allowed to retain even a vestige of their independence. Just to rub it in, the cathedral of Utrecht was reconsecrated as a Catholic place of worship and the first Mass for a hundred years was celebrated with suitable triumphalist pomp. In this crisis the Dutch leadership did not distinguish itself, although victory at sea over a combined French and English fleet on 6 June showed that their enemies were not invincible. On land, the dykes were breached to create a defensive ‘water line’ running from Muiden before Amsterdam to Gorcum on the river Waal. 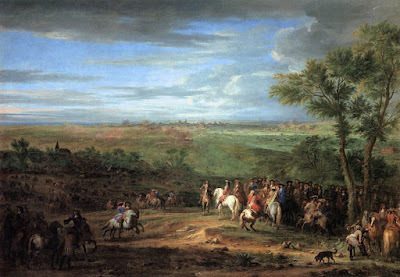 Yet the mood in the councils remained defeatist and Louis XIV might well have secured a surrender if the common people of the towns had not risen to demand resistance and the appointment of William of Orange to lead it. On 2 and 3 July, William was proclaimed Stadtholder of Zealand and Holland respectively. Although the war went badly for some months to come, the corner had been turned. And not just for the Dutch Republic: for the first time, a major European state was in the hands of a ruler with the necessary intelligence, determination and resources to arrest the French juggernaut. This is one of the great might-have-beens of world history. If Jonathan Israel is correct in his view that the ‘water line’ could have been crossed easily for two weeks after it was flooded, because a dry summer had reduced water levels, a final French advance might well have brought the permanent subjection of the Dutch Republic, its navy, its commerce and its overseas empire.